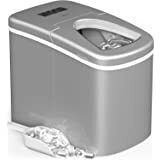 MRP US Portable Ice Maker IC703 With 3 Selectable Cube Size and Timer(White) for Home, Offices, Schools & Commercial Use. 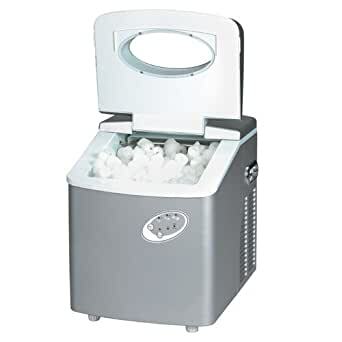 This ice machine is perfect. Sits on my kitchen counter, keeps my drinks cold with perfect tubular ice cubes. 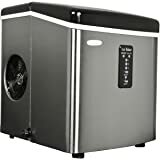 I would very much recommend this machine.... especially because the manufacture has a GREAT customer service department and are quick to respond if you need them, by phone or e-mail. Remember.... a product is only as good as the service you receive. Don't waste your money, please. 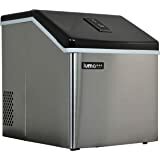 It did make ice for a few months, noisey and kept me busy unloading it to the freezer, but after a few months, it started making a loud buzzing noise, and getting hot where the motor area was. Then I only would use it if I was nearby, didn't trust it, didn't want a fire. I could turn it off and back on and sometimes the buzzing would stop, but never completely. We finally put it on a dolly and took it outside, where it is getting snowed on, and rained on until it gets taken to the dump. Save your money for a new fridge with ice maker or buy bags of ice for about $2-3 per bag. To ship to somewhere for service too expensive, too heavy, not worth the trouble. 3.0 out of 5 starsLasted 2.5 years, then the pump started making noise... and it died. It lasted 2.5 years, and made ice for our cafe, no problem. It even tried these last few months to keep up but its motor was dying and making loud noises, something with the pump made it difficult to keep producing ice. I'm not sure what it was as we cleaned the filter, but couldn't get it to work right. Sigh.. so we are looking for a replacement that has a similar capacity or more, and haven't had much luck. 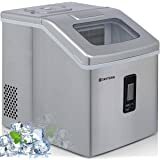 5.0 out of 5 starsIce Maker was a hit! Bought this as a gift...was put into use immediately and is a workhorse! Everyone loved it and the ice, while not clear, tasted just fine. We are thinking about using distilled water or filtered water to see if the ice is clearer. 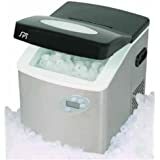 Ran out of regular ice, turned this on, and had enough ice for everyone's drinks. Awesome! I purchased it just before we went on a week-long camping trip. It makes ice very quickly and it made all of the ice that we needed for all of the coolers and for drinks, too. It makes some noise, however not excessive, but that was somewhat expected. I think it is a great product and would recommend it to anyone. It stopped working. I contacted the company I purchased it from and they told me I was 10 days past the 30 day return policy and they would do nothing for me. I then went through the booklet in the box and contacted the manufacturer and they are working with me now. 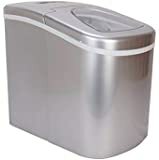 I was skeptical about this ice maker, but have been very happy with it. We always need more ice for family dinners, BBQ's and parties. This was the perfect buy for us. 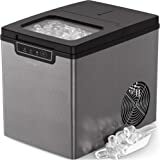 It is great for the price and easily store it in the garage when it is not needed. My kids love the shape of the ice cubes too.